I get paid every other Thursday, or 26 times a year. That mostly means I get paid twice a month, but twice a year there’s a month where I get paid three times, and this is one of those months. Since a big chunk of our expenses are monthly, getting paid three times in a month means I have some extra cash left over to play with, and this month I’m going to use it to replace our home server. Above is our existing home server. It’s a pogoplug device that I’ve hacked to run debian linux. 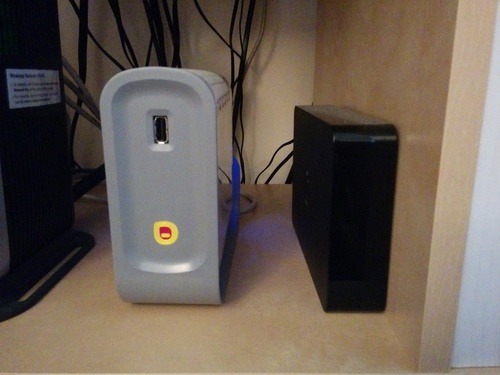 It’s primary function is as network attached storage for all the other devices in the house, and the box to its right is a 2tb USB hard-drive. It also runs a LAMP stack for development, and some torrent software so it can handle downloading duties without any of the other computers in the house needing be kept on. It only has 256mb of RAM though, and just occasionally if it’s under heavy load things fall down. The torrent daemon is usually the first victim: sometimes I go to check on the status of a download only to find that the downloading process has run out of resources and shut itself down. My requirements for a replacement are that it handle all the tasks the existing server does - without the problems caused by the limited memory, uses electricity sparingly, and also gives me room to grow and try new things that I haven’t even thought of yet. My plan is to replace it with a machine I build based on an Intel NUC. 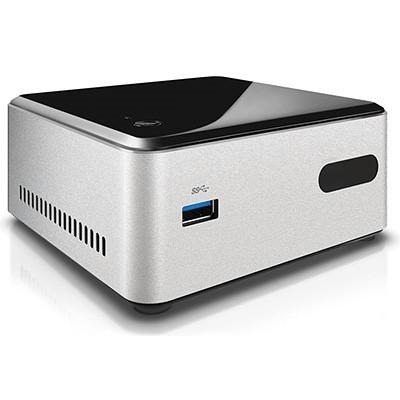 This thing is a barebones machine (it doesn’t include any RAM or storage in the basic package), but it could be useful for many scenarios (I think it would make a great HTPC, for example) including mine. I’m going to max it out with 8gb of RAM, and this 32-fold increase over what I have now should allow for a whole host of new possibilities. I’m going to take advantage of the extra resources by attempting to install vSphere Hypervisor on it and split it into a number of virtual servers. One will be linux-based to replicate the functionality of the existing server, one Windows-based VM, and maybe two extra VMs (one linux, one Windows) so I can separate my playing around from mission-critical server duties. I’ll be posting more as I work my way through the process.